A week ago I found a baby holly tree when I was weeding. I carefully dug it up and potted it and mulched it and watered it, and placed it on the back porch. I went away to visit my parents in the meantime (more on that later). This morning when I looked out the back window, I saw a ring of leaf compost mulch around the pot with the holly. I ran outdoors, and found the poor, wilted, little baby tree lying sadly on the deck, with a blackened leaf and its root as long as the tree is tall still attached. Alas, I placed it in the garbage can and will have to find something else for the pot. Maybe that baby japanese maple I also found (and didn’t dig up) when I was weeding last weekend. Only how to protect it? Sometime in the spring I started reading a blog called Not Living on Ramen, authored by physics major E.C. who writes about personal finance, mostly. I don’t know how I found this blog, but one of the first posts I read was about E.C.’s plan to do some teaching before going back to school for a Ph.D. So I kept reading the blog. E.C. has graduated and joined up with Teach for America, and is teaching summer school in Texas before moving on to a position in the Mississippi delta. The last blog post has taken me back to my first teaching experiences, not as a student teacher, but as a real teacher. I graduated from college with a teaching certificate, a physics degree, and a pile of resumés and letters of recommendation. I didn’t find a job. After the summer job that I did manage to find, I moved in with my boyfriend in a city I didn’t know, and tried to find work. I substituted sporadically in various schools until my boyfriend dumped me. After living with my parents for a few weeks, I moved back to the place I knew the most people and mooched off friends until I could get work. Thank you for your generosity, friends! I had less than $100 to my name, over $10,000 in student loan debt, and I was scared. I got hired two places: an orthodox Jewish school, where I taught Conceptual Physics and ChemCom (Chemistry in the Community) to small classes of all girls four days a week starting in January, and an urban, comprehensive public school where I taught chemistry and 9th grade physical science starting in February. The orthodox Jewish school was fine. The girls were nice, happy to teach me a few words of Hebrew and explain about davening, and we had an extra-long Passover vacation. But every morning at the urban school, I felt sick to my stomach. I had no idea what I was supposed to be teaching in the chemistry curriculum, the kids had been “taught” by daily substitutes starting in October when the previous teacher left for a suburban school (the bureaucracy of the city system made it impossible for them to hire me starting in December, even though they needed a teacher and I was available), and on my first day there not only did I burn out my car battery by having left the lights on, I couldn’t get to my car right after school because there was a large brawl in the street outside the school. My 9th graders that semester figured they didn’t have to do anything to pass, since they hadn’t had to do anything for months and were still passing. Several needed medication for ADHD but weren’t taking it, and one sly girl pulled the alarm on my first day so that ever after, if I had an emergency in the room an needed help, nobody would come because they would assume it was another case of me being hoodwinked by students. The chemistry students were mostly immigrants from a variety of Asian countries, some of them working in factories at night and attending school during the day. Two Chinese boys kept that class under control for me—the science department chair told me that when they were freshmen those boys had left school and walked over to another school where they beat up a teacher before returning to their own classes. I had never, in my sheltered upbringing, encountered kids like these. I went to a public school for gifted students from 5th grade to 12th grade, and I went to an elite private liberal arts college. It was a trial by fire. I was also desperate. I didn’t know what I could possibly do if teaching didn’t work out. I had no money, no apartment, no training for anything else. So I kept at it, doggedly making my way into the city every morning, and out to the suburbs four afternoons a week, and trying to make it work. At the public school, the lab assistant and the science department chair were the most helpful people. These wonderful, positive, strong black women comforted me and also explained with no nonsense what the story was. When a girl said I was “triflin’” and I had no idea what she meant, that got explained to me. They told me about the Chinese boys, and fed me lunch once a week: salad and baked potato. I barely remember the lessons I taught, but I vividly recall the bare classroom, the lack of chemistry books (the kids had stolen them to take home and study for the exam—like I said, these were asian immigrants), the walls of the bathroom stall I hid in every morning, and the day I was told by my supervisor that not enough kids were passing my class and more of them had to pass. That was my last day in that building, after school was out. I was only “provisional” in my status with the school district, and I needed a job for the fall. So I looked at the kids with the highest failing grades, and I changed them to passing grades. I have never done that since. Anyway, I have been communicating with E.C., giving advice and sending books. Yes, starting out as a teacher is very challenging! Having lesson plans is key. Know what you want students to accomplish. How will you be able to tell when they’ve accomplished it? Plan more stuff than you think you have time for, just in case. Then if things go faster than expected you can start the next thing without having time for kids to get into mischief. Activities keep kids engaged. Make sure every activity has a purpose. When you have a long period of time to fill up with lessons, break it up into approximate 20-minute segments, with a mix of activity and practice and discussion and work to hand in. Get students to write as often as you can. Also, get students to graph data and interpret the graphs as often as you can. These are some of the best skills they can have as they continue in school. Unfortunately, every class is different and what works with one class won’t necessarily work with another. You have to learn each class when you meet them. I’ve sent E.C. a box containing Harry Wong’s The First Days of School, which is a very helpful classroom management resource. I also sent some Active Physics books, a book of lab activities, a book of easy science demonstrations, and one of the most inspirational books I read in college: Herbert Kohl’s 36 Children. When I was starting out as a teacher, I got books from several sources. My folk dance teacher had a bunch of physics books that her ex-husband had left in her house. That is how I acquired some Harvard Project Physics readers and handbooks, and some second-edition PSSC paperbacks. One of my friends from back home sent books she had acquired when she was a science teacher. Her brother also sent me some books-I think that is from whom I got my first copy of Paul Hewitt’s Conceptual Physics. I’m glad to be able to offer books and advice. I remember that knot in my stomach so well. If what I am doing helps even a little, it is worth it. Good luck, E.C.! Call if you need to! I didn’t think I was capable of being even more angry at Verizon. Today I got the usual monthly Verizon bill. It gave us credit for having not had any service from June 5 to June 8. In addition, it is an advance bill and covers service through July 11. So I called Verizon. I spent an hour on the phone and talked to a total of 5 people. The first one told me that she couldn’t help me but financial services could. Financial services told me that they couldn’t help me and that I needed to talk to customer service. That transfer dropped my call. That was the first 25 minutes. I called the customer service number that I got from the financial services guy before he tried to transfer me, which was different from the number off my bill. But it was the same phone system. The customer service agent who finally picked up from the horrible music they have on hold (it is very static-y and keeps cutting out so you think someone is picking up but they aren’t really and the music comes back) got to listen to my very fast refusal to be shunted off to financial services again. She kept saying not to pay the bill and there would be a rebate on the next (and final) bill. I kept insisting that we had been without service for 10 days, not four. After about three go-rounds with this, I asked to speak to a supervisor. More horrible hold. Then I got the supervisor, who actually called the repair branch of Verizon, and eventually came back and said that the repair people had logged us as HAVING service from June 9 to June 12!!! Well, the supervisor was able to change the computer record so that it showed the outage from June 4 to June 13, on my say-so. Then she put me in touch with financial services and actually stayed on the line while the financial services person changed my billing so that there is no longer an automatic deduction from our bank account. This upcoming final bill is one I want to go over with a fine-toothed comb when it arrives. I REALLY hope that it will be acceptable and I won’t have to spend another hour on the phone with Verizon. I have come to really hate dealing with Verizon. Hate a LOT. By the time the second phone call was over, a whole hour had passed. Grrrr. In other bad news, I seem to be having a relapse of my cold. The post-nasal drip is back with a vengeance, and now my ears are filled with fluid. They’re not infected, but I can’t hear as well as usual and it isn’t comfortable. I saw a doctor today to get a prescription for that. She said if it doesn’t clear up in about a week, come back and she’ll prescribe the steroids that really do work, but which are steroids. In the meantime, it was a day of manual labor at school. Cleaning up, taking down posters, sorting, putting away, recycling paper, double-checking grades, getting my check-out sheet initialed by appropriate people. Not very exciting, though I did find some things I had misplaced, which was good. Tomorrow is the last day of school for teachers, and I won’t go back until AP scores are in, in mid-July. Today is the last day of school. I gave in to my clamoring and contentious students and started showing them the 1999 movie October Sky yesterday after we finished the quiz. Today we finished watching it with one class that had a double period. October Sky stars Jake Gyllenhaal as Homer Hickam, a teenager growing up in the 1950’s in Coalwood, West Virginia, where his father (Played by Chris Cooper) is a mine superintendent for Olga Mining Company. Inspired by Sputnik and his science teacher, Homer decides to build rockets. He enlists the school nerd and a couple of friends to help. Through trial-and-error experimentation, book-research, hard work, and help from the community, Homer and his team eventually succeed in building rockets that fly high and far. Homer learns math and physics in the process! When I saw this in the theater, I actually applauded when Homer solves an equation. Nobody else applauded though, and I felt embarrassed. I don’t want to spoil the movie for you if you haven’t seen it, but it is very inspirational and based on a true story and Hickam’s memoir Rocket Boys. However, it is one of the few cases where the movie is better than the book, in my opinion. Homer Hickam eventually became a NASA engineer, and has written several more books. I love October Sky…in fact I would have to say it is my favorite movie. I don’t go to movie theaters much anymore. This is mostly because I don’t like the audiences these days…the cell phones, the crying babies, the kicking children, and the high prices. We have a large television and a Netflix membership, and I am patient and can wait to see the movies on DVD. Happy end of the school year! The next two days are for cleaning up and making sure things are set for next year! Yesterday I made strawberry pie. We’ve been getting strawberries from the CSA, and my desire for pie has been gradually building. So on Saturday I went to a farmers’ market and bought two quarts of berries at $6/quart. That is not too much to pay for nascent pie, in my opinion. I also spent $5 for some European Nightcrawler worms to add to the worm bin. I find it hard to resist a 7-year-old with a business plan and a passion for worm composting. My dad has always been the strawberry pie maker in my family. For years after moving away from my parents I bemoaned the lack of strawberry pie in my life, and raspberry pie as well. We used to pick berries at Grandma and Grandpa’s house. My mom loves picking berries. I honestly can only stand to pick berries for a little while. Mom can pick whole jam batches at once and still have berries left over for freezing, pie, and breakfast the next morning! 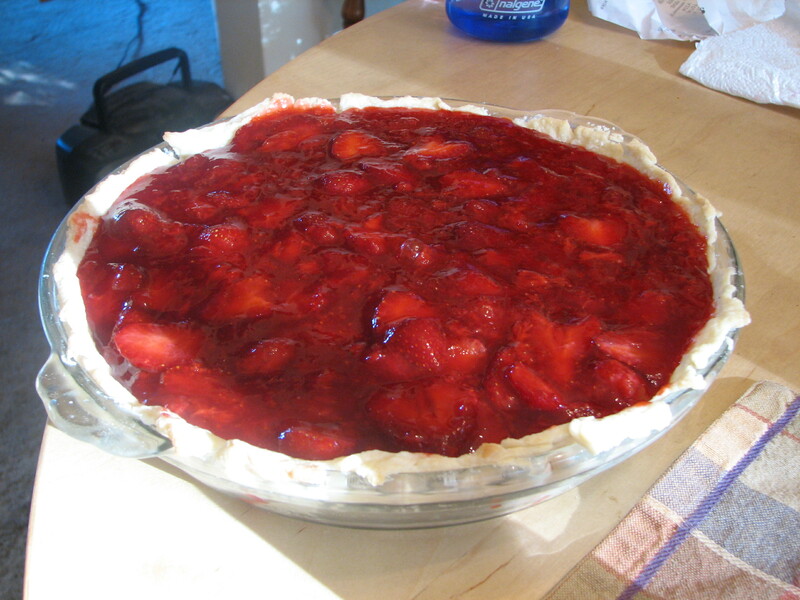 Dad’s recipe is called Strawberry Triumph Pie, and it comes from The Good Housekeeping Cookbook of the 1960’s. My copy is copyright 1963, found in a used book store after much diligent searching. I had previously tried really hard to acquire mom’s copy, but she absolutely refused to part with it! Nowadays, this book can be found on eBay, but they didn’t have eBay back in 1990 when I was looking! With fork or pastry blender, crush half of strawberries; stir in cornstarch, sugar, lemon juice. Cook over medium heat, stirring, until clear and thickened; cool. Cut rest of berries in halves; fold into cooled mixture. Turn into crust. Refrigerate until well chilled. Serve, garnished with whipped cream. In other news, I am in the exciting position of having no papers to grade tonight. I’ll have a few to do tomorrow, and a few to do the next day, but with 4 days to go it is finally feeling like the end of the school year. I am down to a “brain age” of 31 on the Brain Age 2 game that came with my DS (and I think it would be lower if I tested myself in the morning instead of the evening). Tomorrow I am getting a haircut and a hand paraffin dip with the gift certificate I won at the raffle on Teacher Appreciation Day. Finally, I got the sad news today that not enough kids signed up for AP physics at my school for next year, so they will have to come up with some other class for me to teach. While originally nine kids signed up, things happened and kids had to make choices, and the class size dwindled to five. The assistant superintendent decided that 5 kids are not worth 8 periods a week of teacher time. Oh well. I had a great time with my kids last year, and I’m looking forward to being able to show you the Rube Goldberg machine they made when they finally get the video put together! I amazed some friends at dinner Saturday night by reciting the entire sequence of energy transfers the class put together. 8 days of no dial tone so far. I love the phrase “hilarity ensues,” but I don’t use it often because it is a phrase usually used for describing wacky movie plots or stories, which I don’t do much. For example, in Some Like it Hot, two male musicians fleeing the Chicago mob dress as women to land an out-of-town gig, and meet Marilyn Monroe. Hilarity ensues. It’s not really a phrase you want to apply to your life, generally. We would like to talk to you about the pending order to disconnect your Verizon service. What can we do to retain your business so you continue to enjoy a network with 99.9% reliability? Your business is important to us and we want you to avoid the hassle of switching companies. We are constantly creating new discounted competitive bundles to meet your broadband and entertainment needs. So please call us today to learn more about what we are willing to do to keep you as our customer. We have great rates and special discounts. To ensure that your Verizon service is not interrupted, it is important that you call us today. Please call us at 888-706-7544 between 8AM and 6PM EST Monday through Friday to speak with a Verizon representative. Thank you for allowing us to serve your voice, broadband and entertainment needs. 99.9% reliability? I guess that means we’re part of the 0.01% of customers who don’t get the reliable service. OK, I’ll buy that, they’ve got a lot of customers and somebody has to be the 0.01%. But the best sentence is the one about ensuring that our Verizon service is not interrupted! We still haven’t heard back from them on our repair ticket, and we still have no land line service. It’s been over a week, now. I was hoping to hear from them on Monday, since the repair guy we saw on Sunday said he’d have to talk to his manager or whoever on Monday. I guess being a voice, broadband, and entertainment provider doesn’t necessarily imply communication. I was able to figure out how to blog from school—normally our school internet filter blocks “personal and social networking” web sites, but if I go in through the login page I can get into WordPress. I can also check my Speakeasy e-mail from school. But I can’t respond to the Facebook friend-requests. Either I’ve got to mooch internet off friends for that or pay T-mobile another $10 at a hotspot. I think I will just wait for Saturday, since I am busy this week in the evenings and wouldn’t have much time for internet anyway. RCN is supposed to hook us up Saturday morning. By the way, once RCN hooks us up, we’ll have our same old phone number. But if you are a Verizon customer, you won’t be able to call us on your Verizon line for about another week, and in the meanwhile you’ll get a message saying the number has been disconnected. If you have any other phone service, you should be able to reach us. Hilarity, yes. Reasonable explanations, no, I haven’t gotten any of those to pass along to you. Oh, yes, I did still call Verizon’s number from the letter above. It’s amazing how fast you get passed from operator to supervisor when the reason you’re dropping their service is the fact that you are completely without service! In fact, our impending switch to RCN may get us a dial tone today. I am not holding my breath. I have no confidence in these people. The last supervisor I talked to said he would try to get the ticket escalated to today, and as far as I can tell someone showing up in a Verizon truck is no guarantee that someone will actually do something in terms of repair…I mean, we’ve had trucks come twice with no repairs happening, so why should I expect it? Oh well, back to work. I need to finish up some grading and do some cleanup in my classroom. I really shouldn’t be blogging at school! You may know that Nintendo is marketing its DS lite handheld gaming system to women. You may have seen the ads featuring America Ferrera or Carrie Underwood. We are a vast, untapped demographic, apparently. So one way they are trying to entice us women into gaming is by having young hip urban women become “brand enthusiasts.” This means they get a free DS and they get to invite all their young hip urban female friends to a party. I am not a “brand enthusiast” for Nintendo, but my friend Marisa over at Apartment 2024 and Fork You is. The Nintendo people picked her as one of several local women bloggers for their current strategy. She invited me as one of her hip young urban female friends (it’s OK, you can laugh) to a “Girlfriend’s Guide to Gaming” party, which was held last Friday in a rented loft in an older part of the city. Free parking was provided. There was wine, and cheese, and fruit, and other more complicated hors d’oeuvres. There were four sectional sofas each arranged around a coffee table with a particular theme to its decor. Each coffee table also had a little pile of black DS lite game systems. After getting a charm bracelet from one of the Nintendo employees (young women dressed in black and all playing pink DS lite systems) and some wine and some little bits of this or that to try, I sat down next to someone I recognized from Marisa’s birthday party. After some chatting, we picked up the DS’s and learned how to play Nintendogs with help from one of the young women in black. First: how do you turn it on? Then, what do you do? I played with “Spotty” the dalmation. This was pretty dull. Virtual pets are not my cup of tea. Buzz is much more fun, plus my husband converses with Buzz often, which is very entertaining as well. So far, I was not sold. I folded up the game and held out my wrist for the charm: a dog dish with a bone in it. The next game I tried was MarioKart. Still not fun, a little stressful, and I could see how one’s thumbs could be in a lot of pain in very short order. It’s a racing game, and you play against a lot of little characters who I have no interest in, since I have no interest in any Mario-related games. I know he’s a plumber, but beyond that I have no idea. Charm for MarioKart: a black-and-white checked heart. The third sofa I tried featured the game BrainAge 2. This game tests you to tell you how old your brain is, based on the research of some Japanese brain researcher. I had the youngest Brain Age in the room, and on a Friday night! After testing, you can play little games that are supposed to make your pre-frontal cortex more flexible and strong. There is a word scramble, a couple of math-related games, a piano-playing game (which is tricky because you are poking a little picture of a piano with a little stylus on a little screen…I didn’t like that mini-game), and a game where you make change. OK, well, not too bad. Charm: yellow puzzle piece. Finally, I made it over to the Cross WorDS (get it, the DS is capitalized because you play it on a DS!) which was the final sofa. These are not the NYT Magazine Sunday Puzzle. I had a hard time getting into this. There is an anagramming option on this game, which I found annoying because it didn’t accept some words that Online Boggle accepts! I hate playing a game that has a smaller dictionary than the one in my head! However, the young woman in black at this station had a copy of a game called Planet Puzzle League, which I did have a good time with. It was her personal copy, and she said Nintendo was discontinuing it. That figures: the one I like is the one I can’t play. Well, I can play it if I buy it soon. I collected my final charm: a pink shoe (go figure?). Then, since all the guests had pretty much tried all the games, the young women in black came around with the prizes we’d earned by playing all four games: we each received a black DS lite system and a copy of BrainAge 2. What does Nintendo get in return for giving me $150 worth of merchandise (not including charm bracelet or wine and appetizers, or the cost of renting a loft and paying my parking)? I’m thinking that they hope I will buy more games, maybe some accessories, and be seen as a hip young urban woman playing their game system by other women who might then get the idea that they might want one too. I’m considering. I’ll try a few games through my husband’s gamefly subscription, and see if I want to buy any of them. If I find myself using the DS often, I might buy a case for it. The black shiny plastic case shows fingerprints in a big way. My brain age so far is 32. Apparently I’m supposed to be aiming for 20. Today marks day FIVE of no land line service or internet in our household. So we’re taking some time at Starbucks to enjoy snacks, beverages, and $10/day hotspot access. The saga starts with lack of internet on Wednesday morning, discovered by my husband. I checked the outside NID box when I got home (and got soaked when a downpour occurred while I was still doing that) and called Verizon, giving them my husband’s contact numbers, since being at school all day I can’t get incoming calls. They said they would try to get someone out on Thursday, but it would more likely be on Friday. Thursday they called my husband’s work number to say they would be able to come to our house on Friday. When by 5 PM Friday there was no sign, I called Verizon again. The helpful support agent said he’d put it in as a “missed appointment” and to call back if nobody showed up by noon on Saturday. At 12:15 on Saturday, I called Verizon again. This time I was shunted up to a supervisor, who said that someone HAD been out on Friday and marked the repair ticket as “incomplete.” She conceded that someone should have called my husband to explain this, remarked that there were three medical emergencies that had taken priority over our call, and promised that someone would be coming out on Sunday before 5 PM. Well, they managed to arrive before 9:30 AM, only to tell us that we’ve “got [our]selves a problem” and the problem is in the line coming to our house. That fellow said he’d have to explain it to his manager on Monday and they’d be in touch. You can read my husband’s version of this tale at Positively Gaming. We do have a lot of trees and undergrowth on our property. It’s clear that our local land-line service makes us customers low on the priority list for Verizon: we don’t have their long distance, internet, or FiOS service to make us valuable. So we are investigating our options. Cavalier telephone operates in our area, as does Comcast and RCN. We’ve tried Comcast’s cable modem in the past and found the service spotty at times. Supposedly an RCN representative lives on our block, according to the previous owners of our home. There is a heat wave going on right now and we’ve finally turned on the A/C. Buzz is spending his time either on top of his cat tree or in front of an A/C vent. I still have congestion left over from this cold, but I am feeling much more energetic. I have acquired a Nintendo DS game system, through a process that deserves its own blog post. I’ll give one hint: it was free! I now have a facebook page, so if you want to “friend” me, go search for my name there. If you don’t know my name, then maybe we aren’t that close friends and you should comment some more on my blog so I can get to know you. My school’s yearbook doesn’t include me! They FORGOT me! Bummer! This video was mentioned on the AP physics electronic discussion group this week. I love this! I will be showing it to my AP students next year, though I hope they already will have seen it by then. By the way, my internet access from home has been down this week, and we are at Verizon’s mercy for a fix on the land line. So far, no dice. If you are trying to get in touch with me and you can’t reach my home phone, try my cell. At least the voicemail on my cell works! I’m able to read e-mail at school, but today is Friday and I’m outta here in a couple hours.